OXFORD, Miss. 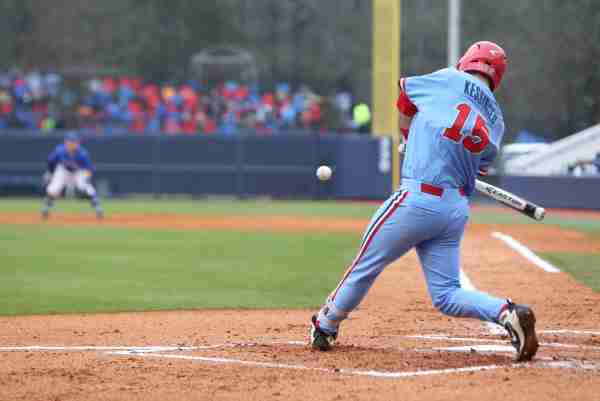 – After defeating Eastern Illinois in two contests on Friday, Ole Miss capped off the series with a 7-3 win to complete the sweep. 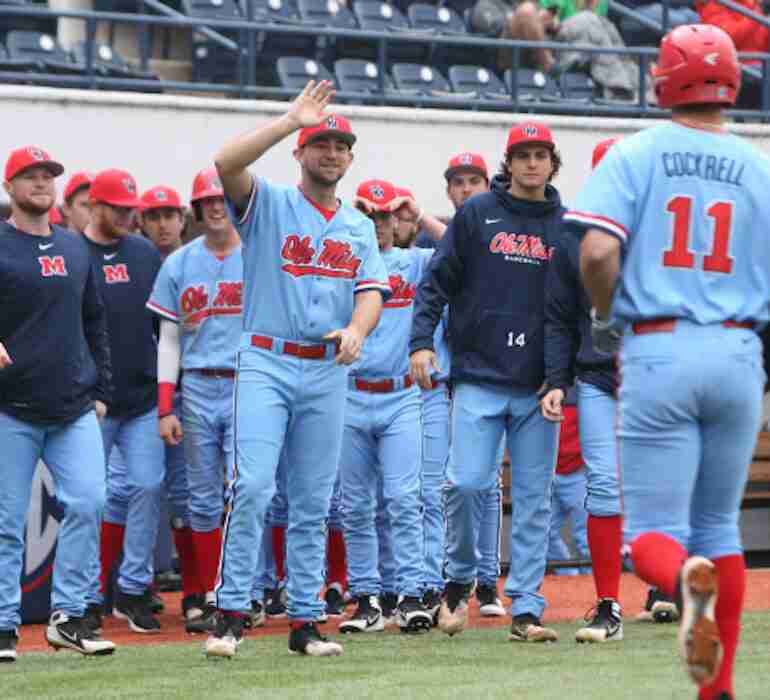 The Rebels, after not falling behind at any point in the first two games, finally conceded a lead in game three when Eastern Illinois’ Dougie Parks sent a ball into the stands to leadoff the second inning. The EIU lead, however, was short-lived. Rebels’ head coach Mike Bianco has been vocal about the importance of being able to manufacture hits and runs with two outs, and his team has responded well. In the bottom half of the second inning, Ole Miss managed to score four runs, all with two outs on the board that gave the Rebels a 4-1 lead. After another Eastern Illinois solo homer, the Ole Miss lead sat at two runs. Then Chase Cockrell decided he wanted in on the fun. Cockrell came into Sunday’s action with one home run on the year but tripled that in just one game. He smashed a solo dinger in the fourth to give Ole Miss a 5-2 lead and followed that up with another in the seventh. He finished Sunday with an absurd stat line, going 3-3 at the plate, two home runs and three runs scored. “He’s getting a lot of good swings off,” Bianco said. Even with Ole Miss having a productive offensive output, Eastern Illinois just wouldn’t go away in this one. They hit their third solo shot of the afternoon in the fifth, but it wouldn’t be enough to overcome the Rebels’ seven runs, something that pleased Bianco. Chase Cockrell was obviously the player of the game, but Thomas Dillard recorded another great performance. Dillard went 2-4 at the plate with both of his hits being doubles, and he also scored the run in the fifth to go up 6-3. 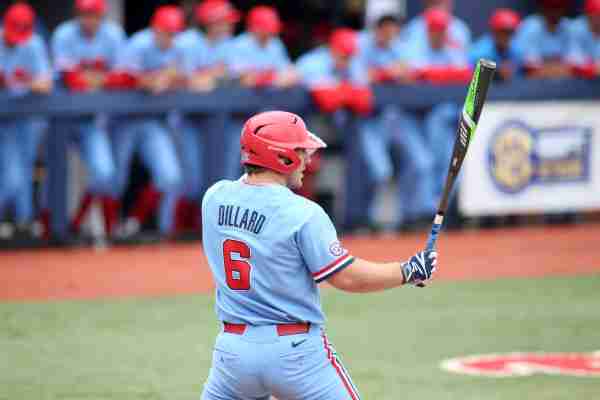 “He’s [Dillard] always going to be a force in our lineup,” Bianco said. Pitcher James McArthur earned his fourth consecutive Sunday start and went 5.1 innings, allowing just three runs–solo home runs in the second, fourth, and fifth inning. Otherwise, McArthur only allowed one hit in addition to the homers. Closer Dallas Woolfolk entered the game for the Rebels in the ninth, only facing four EIU batters before the game was over. Ole Miss finishes the week 5-0 after two midweek wins and three against Eastern Illinois, and the Rebels are now 13-0 at home and 15-1 overall, heading into a pair of games against Georgia State on the road. Justin Dial is a junior at Ole Miss pursuing a Journalism degree. He is from Olive Branch, MS and is an avid fan of college and professional football, basketball and baseball. Justin covered Ole Miss Sports for the Daily Mississippian for one year, and he also works in the University of Mississippi Writing Center helping students with their writing assignments. He spent his childhood going to Ole Miss football games with his grandfather and grandmother (an Ole Miss graduate). Currently, his favorite favorite athletes are LeBron James and Marc Gasol. In Justin's free time he likes to play video games and listen to sports podcasts.